In this guide, you're going to learn everything you need to know about remarketing, including advanced techniques for professional ad managers (starting with part 4 below) and step-by-step instructions for total noobs. Download this guide for later: Get the PDF version of this guide, including the step-by-step beginner's walkthrough and all 21 advanced remarketing techniques. Plus get a "cheat sheet" of my favorite 8 remarketing audiences that increase ROI. Click here to download the PDFs. I've also seen firsthand how well it works for small and medium-sized businesses. In 2017, our agency clients' average cost per acquisition from remarketing was 32% lower than from regular search ads, and 65% lower than regular display! Results like these make it clear: you should be using remarketing if you aren't already. The point of these ads was to get you to share some click-baity content from Svedka on Facebook, like “6 Svedka Halloween Cocktails You Didn't Know Were Cursed”, thereby breaking the curse for yourself and spreading it to your friends. Since Google is the biggest fish in the pond, I’ll show you how to set up remarketing with Google Ads (formerly called Google AdWords). First, just a heads-up that most businesses can use remarketing -- but not all. For example, alcohol, gambling, and most medical devices and procedures are not allowed. You can see the full list of restrictions in Google’s personalized advertising policy. Now that that’s out of the way, the first thing to do is log into your AdWords account (or sign up for one) at adwords.google.com. 1️⃣ If your account is using the old AdWords interface, switch to the new experience. The first option is “AdWords tag”. This generates an additional snippet of code you’ll need to install on your site (or via Google Tag Manager). This option works fine, but if you’re using Google Analytics I would recommend the next option instead. The second option is “Google Analytics”. This option uses your existing Analytics tag, so it doesn’t require you to install anything new on your site. It also has some great features that the AdWords tag option doesn’t have. Excluding people who have already converted on your site -- whether they already bought your product, or they signed up to your email list, or whatever -- is a quick way to drastically improve your results. 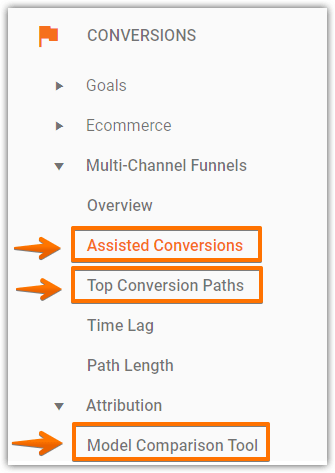 To set this up, you’ll need to have conversion-tracking set up -- within AdWords if you’re using the AdWords tag option, or within Analytics if you’re using the Analytics remarketing option. 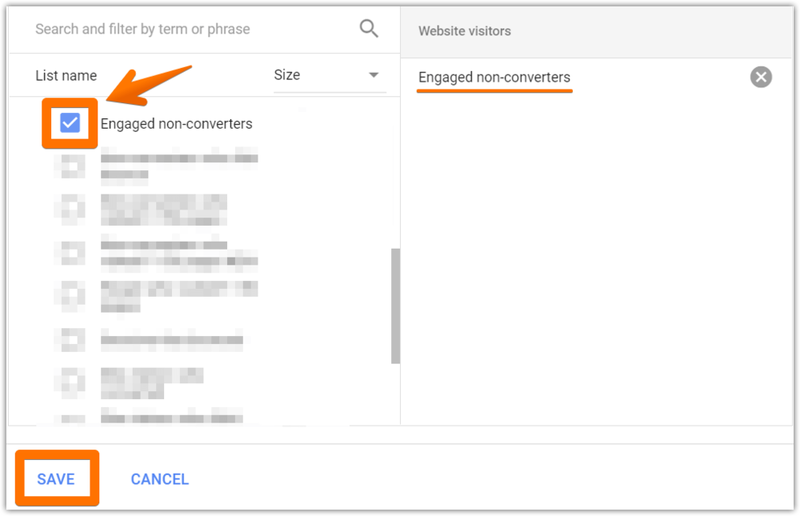 If you have AdWords conversion-tracking set up and you’re using the AdWords tag, you’ll already have an “All converters” remarketing list created for you by default. 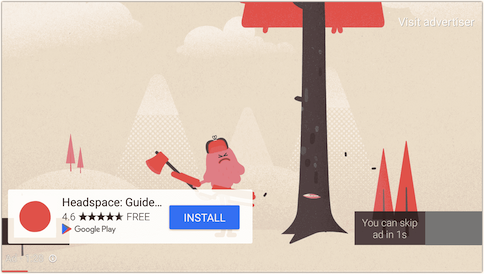 So if that’s you, click here to jump ahead to the AdWords-tag instructions. Google Analytics will prompt you to select your Analytics view (the main or default view you use for your site) and your destination AdWords account. You can also rename the audience if you want. This audience is a template, so you can customize it to your needs -- for example, if you have more than one goal set up and you only want to exclude people who completed a specific one. If you do want to customize it, just click the “Edit” link next to Audience definition. For example, if your main objective is to sell a SaaS product (tracked as an ecommerce transaction) but you only expect people to buy it once. If your customers return to your site in the future to log in, they will be added to your remarketing list when Google sees that they didn’t make another transaction -- even though they did make a transaction in the past. The smallest lookback window option is 7 days, which is suitable if you want people to re-purchase from you on a weekly basis. But you can also go even lower than that if you click back into your audience definition settings and change the filter from “Users” to “Sessions” -- this will eliminate the lookback period, effectively setting it to 0 days. Apply and publish any changes you make, and you’re done setting up your “non-converters” audience! Now click here to jump down to Create Your First Google Remarketing Campaign in AdWords. 1️⃣ Set up a custom combination in AdWords. 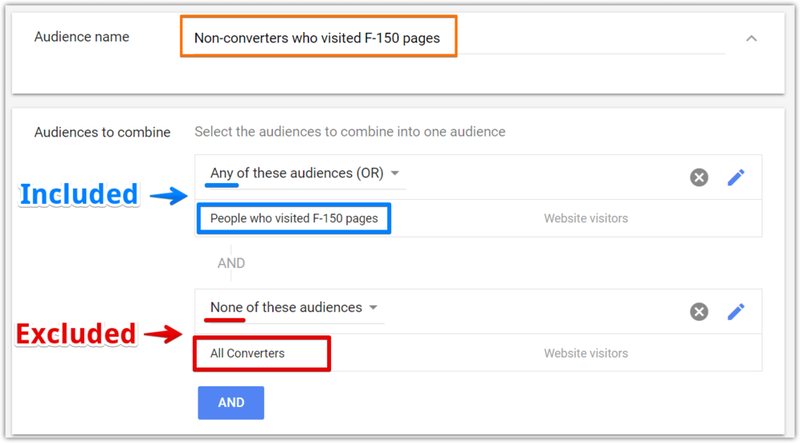 For you AdWords tag users, it’s time to create your “non-converters” remarketing list. Add a new audience by clicking the blue “+” button . Name your new audience. 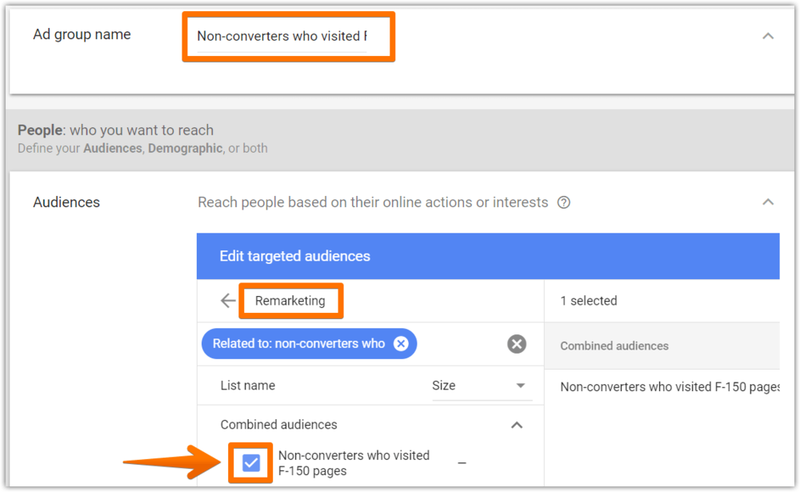 This new remarketing list is going to cover everyone except your converters (or buyers) -- so name it something like “All non-converters” or “All non-buyers”. Under “Audiences to combine,” first select your default “All visitors” audience, then hit “Done". This sets the first audience of the combination. If you used the Analytics tag option for your website, this is the list you just created in Analytics a few minutes ago. If you used the AdWords tag option (and have conversion tracking), the list was automatically created for you. These instructions are for both Analytics tag users and AdWords tag users. 1️⃣ Go to your AdWords campaigns. In your AdWords account, click “Campaigns” in the lefthand menu. Then click the blue “+” button to add a new campaign. I typically choose “Create your campaign without a goal” because it will allow me to see all the options later. You can do that, or you can choose the goal that best fits your business to get recommended settings for that particular goal -- it doesn’t really matter. Keep the Campaign subtype set to the default “standard” and hit continue -- no need to add your URL. Under “Create your ad group,” give your ad group a name like “Retargeting - all non-converters” (or “Retargeting - all non-buyers”). We’ll be setting up more ad groups with different remarketing lists later, so naming the first one this way will help keep things organized. 1) How much you know about the person, based on their behavior -- this is incredibly important, and we’ll get into it more in the next section when we set up additional remarketing lists. 2) How much they know about you -- this is the part we're going to focus on for now. Side note: if you're already running regular Display ads and don't have much time, you can start off by using those for your retargeting as well. But you'll get better results by creating new ads specifically for retargeting. You give AdWords a few different text options and a couple different image sizes. Then Google will automatically assemble an ad from those parts, based on the space that’s available to show it on. This allows you to create one ad and have it fit into over a dozen different sizes and shapes without it looking weird, and it lets you save a ton of time. Responsive ads can be shown as banners, as text ads, and as native mobile banners. In some sizes, they're even animated. If you’re still on the campaign-creation screen from the last section, click the “+ New Ad” button and hit “Responsive ad”. You can either provide images in both sizes or just in the landscape size and then crop it to a square within AdWords. To start, click the blue “+ Images” button. Scan website - this is a great, easy option. 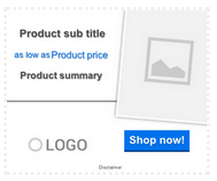 It automatically pulls images from your site, and you can select the one(s) you want to use in your ads. It won’t find every image on your site, but it usually grabs a good number. Upload - for uploading images that aren’t already on your site (or that the “scan website” option doesn’t find). Stock images - free stock images provided by Google. Not a bad option if you’re short on time… but not custom, either. Your competitors’ ads and site copy. Don't copy your competitors word-for-word, but you can turn to their ads and site for inspiration -- and to ensure you’re differentiating your own offering. Your competitors’ unhappy customers. Check Twitter, Facebook, Reddit, and any industry-specific forums to see how your customers talk about your competitors -- particularly anything they complain about that you do differently. Now fill in all the text fields with your responsive remarketing ad copy. Keep an eye on the character counts and ad previews on the right as you do. Save it when you're done. So once you’ve created your first ad, check the box next to it and then copy it by pressing Ctrl-C on a PC or ⌘-C on a Mac... or by clicking Edit ➡ Copy. Then paste with Ctrl-V or ⌘-V... or by clicking the 3-dot menu on the right, just above the table of ads, and hitting “Paste”. In fact, let's go over one of the best ways to do that right now: additional audience segmentation. Because that’s what they'd be interested in. That’s the beauty of this new custom retargeting audience we’re about to create. We're going to filter those people out. NOTE: If you’re using AdWords tagging for your remarketing, this audience isn’t going to work for you. So in that case, click here to jump down to New Audience #2. Google Analytics will prompt you to choose the view and the AdWords property, and you can also rename the audience if you want. “Membership duration” is straightforward: it’s how long you want people to stay on your list, once they’re there. You can go up to 540 days but it's almost always better to stick to a much shorter time period so you don't waste money on hopeless prospects. “Lookback days” determines how long a person has to complete the conditions we’ve set out. We already covered this setting earlier for our basic "non-converters" audience, but it's worth looking at another example to see how it can effect things in this case. Because the lookback period determines the timeframe in which Google will add together a given person's actions across multiple site visits. That would mean that someone who comes to our site today and has 1 Pageview, then comes back to our site in a few weeks and has 2 Pageviews will be added to our audience -- because they’ve had 1 + 2 = 3 Pageviews within a 30-day period (Lookback days). 4️⃣ Publish your Audience to AdWords. If your Audience destination isn’t already selected, just select your AdWords account and hit “Publish”. 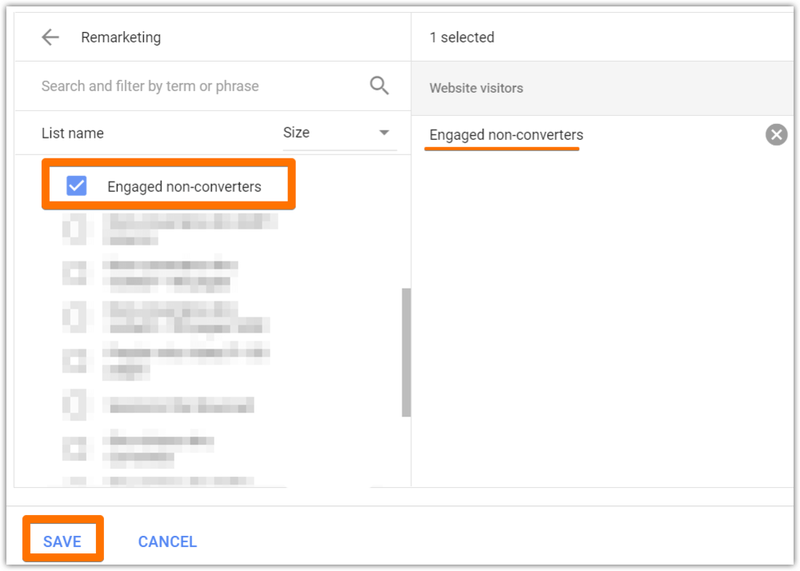 5️⃣ Create a new AdWords ad group for your “Engaged non-converters” audience. Inside your AdWords account, go back to the Ad Groups level of your Remarketing campaign. Now click the pencil icon to edit the name of the #2 copy. Name it “Retargeting - engaged non-converters” (or non-buyers). In the “Audiences” section of the lefthand menu, click the Exclusions tab and then hit the blue “+” button. Under “Exclude from,” choose “Ad group” and then select the original “Retargeting - all non-converters” ad group. You can use this audience regardless of whether you’re using AdWords tagging or Analytics tagging. 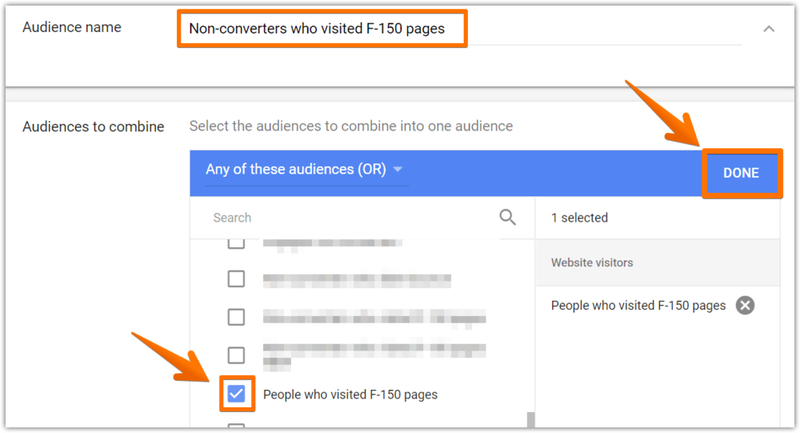 If you’re using the Analytics tag, click here to grab the audience template, then follow the steps to connect it to your AdWords account like before and rename it based on the page(s) you care about. If you’re using the AdWords tag, click the wrench menu at the top of your account, then hit “Audience manager” under Shared library. Then hit the “+” button and choose “Website visitors”. For AdWords tag users, we need to make two remarketing lists. 3️⃣ Create your custom combination to exclude converters (AdWords tag users only). AdWords tag users: click the blue “+” button again and choose “Custom combination” this time. The rest of these steps are the same whether you’re using the Analytics tag or the AdWords tag. Go back to the “Ad groups” tab of your AdWords Remarketing campaign and click the blue “+” button to add a new one. Click over to the “Audiences” section in the lefthand menu, then go to the Exclusions tab and click the blue “+” button. If you also have an ad group for “Engaged non-converters,” (I’m looking at you, Analytics tag users), you should set up an exclusion for that ad group the same way by hitting the blue “+” button again, selecting the “Engaged non-converters” ad group, and excluding the “Non-converters who visited [description] pages” remarketing list again. 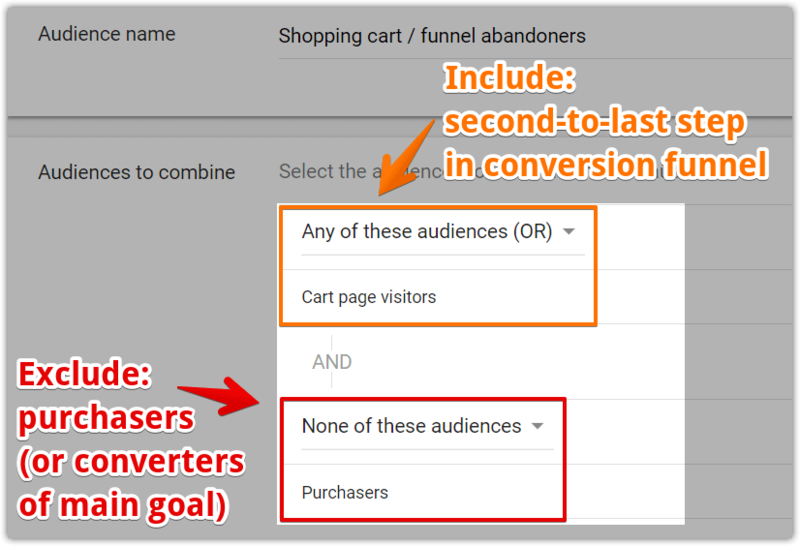 If you’re using the Analytics tag, click here to grab the Analytics cart abandoners audience template, then follow the steps to connect it to your AdWords account as usual and be sure to edit it for your needs. Note that it excludes both purchasers and goal completers: you may only need one or the other, but it’s also fine to keep both. However, be careful not to exclude all converters if you have multiple conversion types or goals set up -- you only want to exclude the people who went through the final, main conversion point. If you’re using the AdWords tag, you’ll need to create two remarketing lists again, in AdWords under Shared library ➡ Audience manager. Just like before, the final step is to set up targeting exclusions in AdWords to exclude your new audience of cart / funnel abandoners from your existing remarketing ad groups or campaigns. And in Part 3 just now, you added retargeting audiences for three more groups of people (engaged non-converters, people who visited specific pages, & conversion funnel abandoners / cart abandoners) -- and created ads designed specifically to convince each of them to come back and buy or convert. You'll also get a bonus "cheat sheet" of my 8 favorite remarketing audience segmentation ideas to increase your ROI. Okay, grab some coffee and let's do this! Segmenting your visitors into multiple remarketing lists is the #1 technique that separates a winning campaign from a losing one. Because different people have different needs and interests -- which translate into different ways you should be advertising to them. The more surgically you can do that, the better results you'll get. If you haven't noticed, I’m a sucker for segmentation. At Blue Mint Marketing, we make money by selling paid marketing courses for entrepreneurs who need to do it themselves, and by selling marketing services to businesses that can't (or don’t want to) do it in-house. When they're not coming to us as a referral, then trusting us generally means reading our content to see that we know what we’re talking about. In a time-based retargeting ladder, you change your ad frequency and messaging as your audience gets farther away from you... rather than as they get closer to you. For example, the people who visited your site within the past 7 days would get different ads and have a more aggressive frequency cap than the people who visited your site 30 - 60 days ago. If you’re using AdWords remarketing tags, you’ll need to set up your time-based audiences manually. Then, for each of your time-based audiences, be sure to exclude all the time-based audiences that are shorter than it -- either by using a custom combination audience or by using audience exclusions in the ad group/campaign. Remarketing lists for search ads (RLSA): Target the people on your remarketing lists when they make searches on Google. This is a no-brainer, easy way to improve your search ads' performance. I know many of you probably see remarketing lists for search ads as old news. But I'm going to show you some things you probably aren’t doing with them. Go to the Audiences section in the lefthand menu of AdWords, then hit the blue “pencil” button. 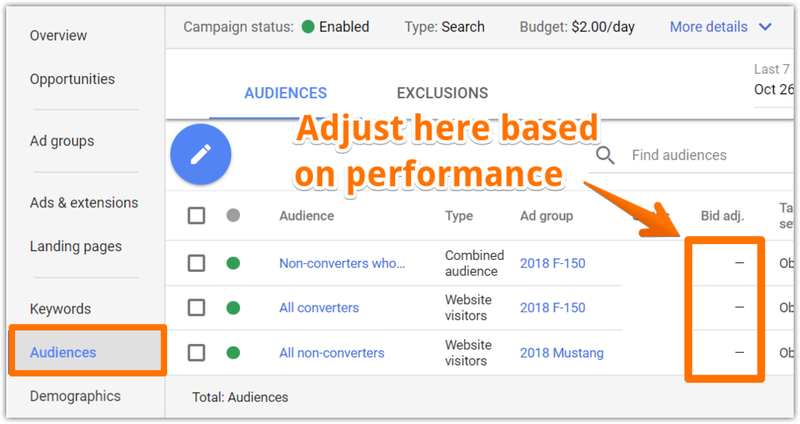 You’ll have more fine-tuning abilities if you do this at the individual ad-group level... so for dedicated AdWords managers, that’s what I recommend. But the campaign level takes less setup and management time, and it still works well. For a list of non-converters, you can usually safely give it a small bid increase -- say, 5% or 10% -- and start seeing some benefit right away. Now let's look at those more advanced ways to use remarketing lists for search ads. This is a great quick win... but it doesn’t take full advantage of your remarketing lists. This strategy uses the “Observation” audience setting as shown above. your remarketing audiences with search ads. It uses the “Targeting” (formerly called “Target and bid”) setting to ONLY show ads to people who are on your remarketing list. You just need to create a new search ad group, and add a remarketing list to it just like we did for the basic strategy… only this time, choose the “Targeting” option instead of “Observation”. 1️⃣ In your AdWords account, go to the wrench menu ➡ Shared Library ➡ Audience manager. In the “Audience lists” section, hit the blue “+”, then “Customer list”. If you’re using an email list, no names or other information is needed -- just the email addresses. You can just throw your list of email addresses into a column in a spreadsheet, put the word “Email” at the top as the header column, and upload it. Remarketing tag or Analytics tag with dynamic remarketing parameters. In order for Google to see which products your visitors are viewing, you need to set up some more advanced tagging options on your site. You can use the AdWords remarketing tag with remarketing event snippet or Analytics tag for dynamic remarketing. The dynamic remarketing ads themselves. As I said, your ads will be generated and served automatically -- but you do get to make some decisions first about what they’ll include. To get started, click the wrench menu on the top right of your AdWords account ➡ Shared Library ➡ Audience manager. Make sure you’re in the “Audience lists” section, hit the big blue “+” button, and choose “App users”. But for iOS apps -- or if you’d like to segment your audience based on the actions they’re taking in your Android app -- a bit more setup is required. Number one is also pretty simple, but let's go over the process for it real quick. Start at the wrench menu on the top right of your AdWords account ➡ Shared Library ➡ Audience manager. If you haven’t already linked your YouTube channel(s) to AdWords (or if you’re not sure), click “Audience sources” on the left, then scroll down to YouTube and hit “Link to YouTube” and follow the instructions to do so. Once your AdWords account is linked to your YouTube channel(s), click over to “Audience lists” on the lefthand side (wrench menu ➡ Shared Library ➡ Audience manager ➡ Audience lists). Then hit the big blue “+” button and select “YouTube users”. You can also change your conversion-tracking attribution model in AdWords to alternative options like position-based or time decay. Many of his famous advertising quotes center around that idea. It should be considered Advertising 101, but most businesses still don't do it very well. For most of us, though, that might be too restrictive -- “Observation” is good enough. That way you can set up custom bids or bid adjustments to pay more when your ads are perfectly suited to the places they’re being served, but they’ll also show elsewhere when it’s cheap enough to do so. *The one exception is Display Keywords, which can only be set to Targeting -- so don’t use them if you don’t want to narrow your reach that way. Go to your AdWords campaign ➡ Settings ➡ click Additional settings ➡ Frequency capping. Usually the right frequency cap is going to be around 2 - 9 total impressions per day. In AdWords, you can add them as columns at the campaign level. Ad agencies know how important it is to personalize ads based on their audience’s preferences, habits and demographics. That's what the David Ogilvy quote was about at the beginning of this section. Here's how important it is: personalized ads perform an astounding 3 TIMES BETTER than non-personalized ads. All of that information is already available to you. It can be found in the “Audience Insights” AdWords report. In this case, many of the people in this list are in the market for trips to Houston as well as study abroad programs... and they also appear to be luxury shoppers and nightlife enthusiasts. In area 2 of the image, Google shows us that there are 4 billion impressions and 100 - 150 million cookies (basically users) that can be reached each week on the Google Display Network in the US, if we were to set up a Display campaign targeting solely the “luxury shoppers” affinity. And of course, the “Ad groups” column shows you how many ad groups you currently have set up targeting each of these audience types, with little “+” buttons in case you want to quickly add that targeting. But AdWords doesn’t allow you to narrow down remarketing campaigns by adding new interests and affinities: those targeting types will only expand your audience, turning your campaign into a less-focused remarketing & Display hybrid. 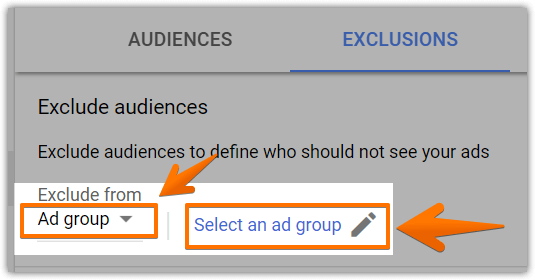 To exclude them (while staying in the old AdWords interface), just go to the campaign or ad group you want to modify, click the Display Network tab, then the “+ Targeting” button, and scroll down to exclusions and add the one(s) you want. Just keep an eye on your performance afterward to ensure you’re not throwing out good prospects. The higher the percentage of your audience that consists of those people, the bigger the potential impact will be -- good or bad. This guide has a lot of tips for running highly effective retargeting campaigns. But to be honest, most of it is pretty cookie-cutter. That small-sounding detail can make a big difference -- I don’t recommend the aggressive option if you have a limited budget. Then click the blue “+” or pencil button. Just be extra careful with your membership duration, frequency capping and placements when you use this trick, and exclude people once they do share -- you don’t want to piss off any big influencers. Consistency of message and offer - to avoid confusion, be wary of testing vastly different offers (especially pricing) on different networks at the same time. You can certainly call out different features & benefits of the same offer, though. Frequency capping - when you originally set your impression caps in AdWords, you may not have had any other remarketing ads running. So if you also expand to Facebook retargeting, for example, it’s a good idea to reduce your frequency caps to avoid annoying people. Tie together the same users across multiple networks - email addresses in particular can be used as an easy way to target the same people across multiple networks. Third-party tools like AdRoll are another good method. Now it's your turn: leave a comment below and let me know what you're going to implement first. Will it be a time-based retargeting ladder? Will you test different frequency capping settings? Or will you try something more "outside the box"? Maybe you've never used remarketing before and you're about to launch your first campaign. But first, click the image below to get a free PDF of this complete guide for future reference -- plus a bonus "cheat sheet" of my 8 favorite remarketing audience segmentation ideas to increase your ROI.